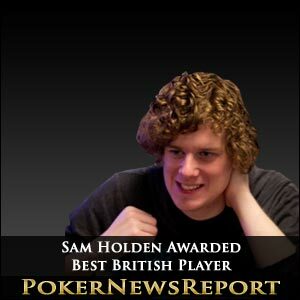 Super Sam Holden has won the 2011 WPT Magazine’s readers’ award for Best British Player, while American Ben Lamb collected the Best International Player gong from the UK-based publication’s vote. The 22-year-old Englishman burst on to the scene with his November Nine appearance at last year’s World Series of Poker (WSOP) in Las Vegas, where he picked up $782,115 – his best cash so far – for finishing ninth in the main event won by Germany’s Pius Heinz. Originally from the village of Herstmonceux in East Sussex, Holden – who is now based in London – was thrilled to be recognised by the publication after seeing off players such as runner-up Jake Cody for what was an amazing 2011, especially with his first WSOP venture ending so successfully. A humbled yet delighted Holden spoke to WPT Magazine about his success, saying: “I’d like to thank everyone who voted. Holden – who became the first November Niner from Britain since James Akenhead also finished ninth in the 2009 main event – ended last year on a massive high when winning the Late Night Poker Final in Wales in late November for $150,000. Certainly, Holden did well to see off the challenge from Team PKR Poker Pro Cody as the Rochdale native actually did collect a first WSOP bracelet last summer at the Rio All-Suite Hotel & Casino when pocketing $851,192 for winning the $25,000 buy-in Heads-Up No-Limit Hold’em Championship. But Team 888poker Pro Holden has already amassed $943,426 in live poker tournament earnings – and will surely break through the one million mark very soon. Lamb, meanwhile, was honoured with the Best International Player award – and will also be featured in the March issue of the WPT Magazine. The 26-year-old – who splits his time between Vegas and Tulsa in Oklahoma – was named last year’s WSOP Player of the Year after finishing third in the $10,000 main event for $4,021,138, while he also collected $814,436 for winning the $10,000 Pot-Limit Omaha Championship. Additionally, the one-time WSOP bracelet winner took second in the $3,000 Pot-Limit Omaha event in Vegas for $259,918, as well as $201,338 for his eighth place finish in the $50,000 buy-in Poker Player’s Championship and $56,140 following his 12th in the $10,000 Six-Handed No-Limit Hold’em Championship to leave Sin City richer by an incredible $5,352,970. Really, all that is missing from Lamb’s resume is a major WSOP title – and that occurrence is surely only a matter of time away following 13 cashes at the world’s most prestigious gathering of poker players for $6,178,387 in earnings. Lamb beat 52-year-old Erik Seidel – who has eight WSOP bracelets – into second place in the Best International Player category, although voting must have been tight as the New Yorker enjoyed a fantastic 2011, particularly in High Roller events. The former Wall Street trader also managed five more WSOP in-the-money finishes last year to take him up to a highly impressive 67 and $4,512,901 in total winnings from the series. Other individual categories saw Croatian beauty Tatjana Pasalic lift the Best Poker Personality award, while Englishman Kevin ‘kevsteele’ Steele was named as the Best Online Player. Pasalic – whose nickname is Tasha – is a delight to watch with her sparkling smile and relaxed personality while at the felt, so it hasn’t exactly come as a great surprise that the readers of the WPT Magazine favoured the 27-year-old. The wonderful Kara Scott, who took second place behind Pasalic, must also have run the Croatian cracker close as British poker fans have become beguiled by her ease in front of the camera while presenting shows such as High Stakes Poker and Poker Night Live – and now reporting for ESPN’s coverage of the WSOP. The 34-year-old Canadian lived in Britain for 10 years before leaving the European islands for California, where she has continued to charm viewers. But she is also a handy poker player, having amassed $567,295 in live tournament earnings. That total for the Team PartyPoker Pro includes $413,612 for finishing as runner-up to Sweden’s Christer Johansson at the 2009 Irish Open’s €3,200 buy-in No-Limit Hold’em main event in Dublin. Possibly the biggest shock at the awards came with Steele’s success in the Best Online Player category after he beat serious online grinders such as Denmark’s Team PokerStars Pro Mickey ‘mement_mori’ Petersen, Brighton’s Chris ‘Moorman1’ Moorman and American star Jordan ‘jymaster11’ Young to the honour. However, I don’t subscribe to that belief as Steele won the PokerStars Sunday Million twice – for $297,632 in total – within four months after first picking up the cash in July and again in November. It should also be noted that Steele is not a multi-table grinder – unlike the three other players named above – having only played 334 events at PokerStars by the time he had won his second Sunday Million. The other awards handed out went to Nottingham’s Dusk Till Dawn in the Best UK Card Room category to see off the competition from Stoke’s Circus Casino, while A World of Poker emerged victorious in the Best Online Forum section when gaining more votes than PuntersLounge. Dusk Till Dawn has certainly made a massive impact on British poker as the world’s greatest game goes from strength to strength on the islands and fully deserves a second successive victory – even if only just beating Circus Casino. Last, but by no means least, A World of Poker took the Best Online Forum award after enjoying a fabulous 2011 in which the community-based website upped their game and secured a partnership with The Nutz TV – who provide extensive coverage from the world’s major poker tours and festivals, including the Grosvenor UK Poker Tour (GUKPT) and Gala Casinos British Poker Tour (GCBPT).